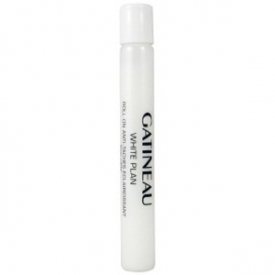 Helping to prevent and reduce the appearance of pigment flaws by encouraging lower melanin production the Gatineau White Plan Skin Lightening Anti-Brown Spot Roll-On uses a high concentrate of active ingredients to intensively reduce brown spots. Step three in the White Plan skin routine, the Gatineau White Plan Skin Lightening Anti-Brown Spot Roll-On has been specially formulated to help prevent and reduce the appearance of brown spots and other pigment flaws. Its roll-on format targets specific areas to improve face, throat and hands more effectively. The innovative White Plan from Gatineau is a line of skin saviours that when used regularly and in synergy, lighten the skin and restore the radiance of your complexion. Using a triple target action: lightening, moisturising and lifting, this impressively formulated skin regime will leave skin velvety soft and visibly lighter. •Apply to pigmented flaws as often as necessary. •Delicately massage for perfect absorption. •Always apply a sun protection product afterwards. •Avoid sun exposure as much as possible. •Can be used on all skin types. This skin whitening target pen is perfect for those that have pigmentation marks, cause by age or illness both on the face and backs of the hands. Due to hormonal issues and acne scarring I have pigmentation marks on my face and I sourced this product after I had read reviews on the efficiency of this serum. The product is a cross between a gel and a serum and is housed in a fantastic pen tube with roller ball applicator which is perfect for targeted application. You apply the serum as often as required throughout the day as it contains calming agents that do not dry out the skin or irritate. It took a period of a month before I saw any results but after this time my dark pigmentation began to fade day by day. This has not eradicated them completely but now they are barely noticeable. This is an excellent product and when used in conjunction with other products in the whitening range the results are phenomenally fast. No need to be conscious of your complexion any more just reach for this wonder pen. "A wonderful product for reducing pigmentation"